Hey friend, you’re probably wondering, what is going on with us? Where did the website, articles, resources, and interviews go? Well, you’re right. We’ve been changing things up, but all for a good reason. The launch of our first product, The Journal Collection is just a glimpse of what we’ve created for you. We’re at an amazing turning point as an organization. We’ve been at it for a while, and now it’s time. It’s time for A New Thing. Something that will support you in becoming the woman you were created to be. 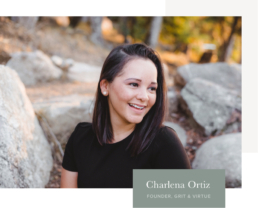 Now, if you’re new to Grit & Virtue, welcome to the party! We’re more than an inspirational Instagram feed or even a beautiful journal company; we’re a community of everyday women on a mission pursuing wholeness and personal development in every season. But, we’re not new to the arena. After years of coaching women both personally and professionally, I couldn’t ignore the patterns I began to see. Women building out of fear, being aligned with false identities, feeling disqualified and alone. Living life without a plan and confused about their purpose. This realization weighed heavy on me, and I knew something needed to change. So in 2014, we began the journey of developing Grit & Virtue. We’ve been focusing on learning as much as possible by listening to our tribe. Recently, thousands of women from our community participated in one of our surveys. The findings, although not surprising, confirmed and completely aligned with our framework to support women. In response, we’ve decided to move swiftly, to put things in motion, and leap into a new season of growth as a company. It’s time for A New Thing! SO, GET READY! We have some exciting changes that we’ll begin to roll out over the next few months, starting with a new website to help guide you towards all the services and resources that will be available for your personal development and growth. That is just the beginning. We’re committed to standing in and up for women so they can accomplish their missions and reach their God-given potential. Join us! Make sure you’re signed up for our weekly insider newsletter that drops every Wednesday. Bringing joy, growth, and spiritual alignment into your inbox. you up in the areas of faith, work, and identity.